The Metropolitan Grey ambiance plays on bi-tone refinement: Graphite grained leather and Graphite cloth seat upholstery with a dark grey strip on the top. Grey console and dashboard insert. The Hype Brown ambiance expresses an exceptional high-end approach: Brown Nappa leather and black leather-effect seats with a light grey Alcantara strip at the top of the seat backs. Brown console, dashboard insert and instrument panel hood; Black / Brown two-tone full-leather steering wheel. New C5 Aircross SUV is the latest model to feature a suspension with Progressive Hydraulic Cushions®, a Citroën innovation driven by the company’s expertise in suspension systems. This specific technology is derived from the Brand’s experience in motorsport and provides better absorption of uneven surfaces with the aim of creating a "magic carpet ride" effect for its customers. The broad and welcoming seats of New C5 Aircross SUV bring passengers an all-new travelling experience with outstanding comfort. The addition of 15mm-thick foam makes them even softer and more durable. The front seats are filled with high-density foam to avoid poor posture after long periods of driving and are also height-adjustable and heated. With its three full width, individual, sliding, incline-adjustable and folding rear seats, New C5 Aircross is the most modular SUV in its segment. These seats are incline-adjustable with five positions and can slide forward and back, allowing you to optimise interior space or boot space, according to your needs. They also fold down to provide a flat floor for easy loading. New C5 Aircross SUV also boasts many storage compartments, including the central armrest. New Citroën C5 Aircross SUV has wide seats and backrests, inspired by the world of furniture design. The innovative design, combining high-density foam in the seat centre and a 15mm thick textured foam on the surface, ensures softness and support at all times. New Citroën C5 Aircross SUV offers height-adjustable and heated front seats and height- and reach-adjustable front headrests. 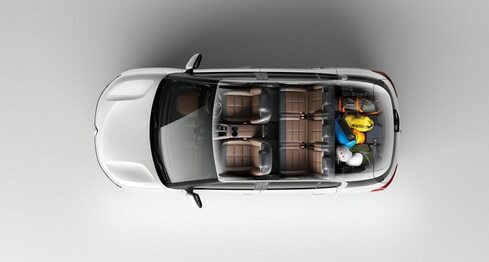 With its three full width individual rear seats, New C5 Aircross stands apart in its segment. They provide the same level of comfort for the three passengers in row two. Adjustable over 150 mm, they can slide back and forth to transform the cabin or boot space according to your needs. They can be tilted to offer five different positions. 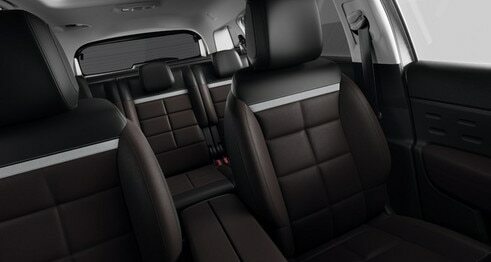 The seats fold down to provide a perfectly flat floor thanks to the dual-level boot floor. New Citroën C5 Aircross SUV also offers ample storage space, with its central armrest, its glove compartment, and its wide door pockets. 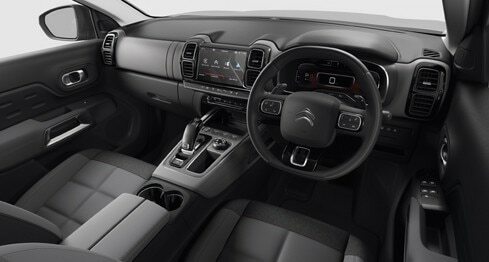 It also boasts a large storage area at the front of the central console, equipped for wireless smartphone charging. 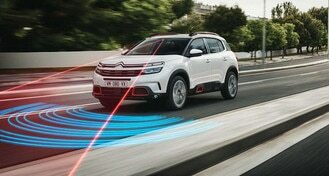 For the optimal comfort of passengers, New Citroën C5 Aircross also offers an air purification system in the cabin, AQS for “Air Quality System”, which detects exterior air pollution and filters it by automatically adjusting the mode of circulation in the cabin. New C5 Aircross SUV comes with a broad range of driver assistance systems, with 19 technologies for safety, on-board comfort and simplified driving regardless of exterior conditions. 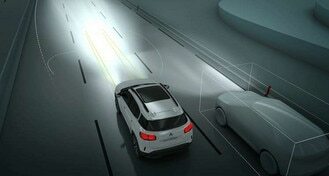 This system represents a first step towards autonomous driving, as it allows the car to handle its own speed, trajectory and lane position functions. 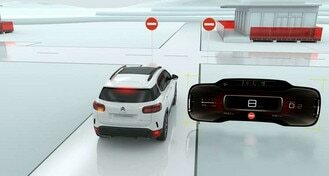 It combines adaptive cruise control with the Stop&Start function, enabling the car to stop and restart automatically based on the movement of the car in front of it. It recognises speed limit signs and displays this information on the instrument panel. This speed can be selected as an instruction for the speed limiter/cruise control in one simple movement. In addition to speed limit signs, the system recognises certain road signs and transmits the information to the driver via the instrument panel (Stop signs / One-way signs / End of speed limit restriction). It makes driving at night safer and more relaxing thanks to the automatic management of high- to low-beam headlights (and vice versa). New C5 Aircross SUV offers a range of efficient and powerful Euro 6.2 engines, with the 6-speed manual gearbox or the 8-speed automatic gearbox: 2 petrol versions: PureTech 130 S&S 6-speed manual and PureTech 180 S&S 8-speed automatic and 3 Diesel versions: BlueHDi 130 6-speed manual, BlueHDi 130 S&S 8-speed automatic and BlueHDi 180 S&S 8-speed automatic. The most comfortable and stylish SUV, New Citroën C5 Aircross SUV is now available as a miniature. This powerful and dynamic model is available as a 1/64 scale in 3 colours: Red, White and Tijuca Blue and a 1/43 scale model, available in White or Red.